Well, the life of US President Donald Trump is something that is no longer kept under the wraps. If the reports are to be believed, Donald Trump has currently been banned from feasting on something he loves the most, cheese burgers. Donald Trump had also cleared the air by stating that he liked to eat at McDonald's nobody knew he was coming and the food was safely premade. Donald Trump has been forced to trade beef burgers for salads in order to maintain his 'diet'. The President of the United States, Donald Trump is someone who was known globally even before he became the most powerful President in the world. However, his personal life became more public after he stepped into the shoes of the President of the US. 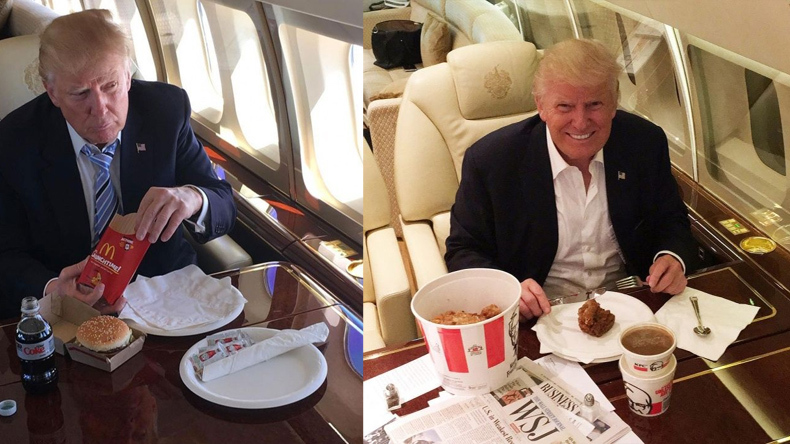 Apart from his alleged love affairs with super models and adult movie stars, Donald Trump is known to have a soft space for the junk food and that is something which is no secret. In fact, there have been several times when the President actually bragged about it. The love affair of Trump and cheese burgers was something that also got highlighted in a book by Michael Wolff – Fire and Fury: Inside the Trump White House. However, just like his other affairs, US President Donald Trump had reportedly ended feasting on junk food like fries and cheese burgers which are known to be his all time love. Donald Trump had also cleared the air by stating that he liked to eat at McDonald’s nobody knew he was coming and the food was safely premade. He claimed that he had a long-time fear of being poisoned. Well, following his increasing belly and weight, the US President has currently been banned from consuming cheese burgers. As per a report by Bloomberg, Donald Trump has been forced to trade beef burgers for salads in order to maintain his ‘diet’. Donald Trump who reportedly weighs around 239 pounds (108.409 kg) is measured to be just one pound below obese. His doctor Rear Admiral Ronny Jackson has advised him to eat less fat and carbohydrates and to exercise regularly. The 6 feet 3 inches tall, US President has said to embraced the new changes in his menu and is said to be enjoying the salad food. Meanwhile, it would be interesting to see that the US President Donald Trump who actually ran the election campaign that reportedly included two Filet-O-Fish sandwiches, a large chocolate milkshake and also two Big Macs for every dinner.